Whatever your moving needs may be, Meathead Movers will help you feel at home in Bradley. Our professionally trained student-athlete movers and our moving concierge will be with you for the entirety of your move to Bradley. Welcome to Meathead Movers of Bradley! If you are moving to or from anywhere in Bradley, we are the moving company for you! Our professionally trained student-athlete movers and our moving concierge service are here to help you with every stage of your move in Bradley. As a small town of about 100 people, Bradley offers its residents an opportunity to escape busy city life. Despite its size, thousands of music and art lovers flock to Bradley every year for an eclectic mix of music, arts, and culture at the Lighting in a Bottle festival. With a warm Mediterranean climate, Bradley is the perfect place to explore outdoors, especially with Lake San Antonio located nearby. Bradley’s ideal central coast location, means that popular San Luis Obispo and Monterey county locations are just a short drive away. 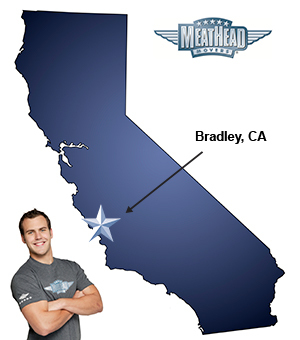 If you are considering moving to or from this area, Meathead Movers is here to help. Our moving company specializes in local, long-distance, and commercial moves to, from, and within Bradley. We also provide reliable packing, storage, on-site relocations, and our distinctive moving concierge service. All our student-athlete movers are thoroughly screened and trained before their very first move. With branches not just in Bradley, but all throughout California, we are your one stop resource for all your moving needs, no matter where your California move takes you. In fact, you can see what your neighbors in Bradley have to say about us. With our 100% satisfaction guarantee, the only thing you have to lose is the stress that comes from moving! So contact us today for a free moving quote and to learn how we can help you on your next move! Came to do a job and they did! The crew was friendly, eager to please, helpful, funny, resourceful, serious, competitive, knew how to do there jobs very well. Thanks?? It's easy to schedule a move and work with the entire Meathead team. I get excellent customer service from start to finish. Very efficient, acomadating, helpful staff and movers. Great! Prompt, polite, and good communicators. Excellent - attitude, training, care taken, abilities.